from 03-08-2018 to 24-08-2018. These vacancies are reserved for male candidates only. Selection for these PC KSRP vacancies will be held through Physical Tests (PET/PST) and online written test. 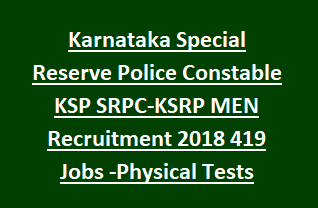 For more information regarding Karnataka Special Reserve Police Constable SRPC-KSRP Men recruitment see the details given below. Official Answer Key not at released. There are total 517 vacancies available in this KSP SRPC-KSRP Recruitment. Battalion wise vacancy details are given below. For 2A, 2B, SC, ST, CAT-01, 3A & 3B: 18-27 Years. For ST (Tribal) candidates age limits are 18-30 Years. For SC, ST and Cat 1 candidates Rs.100/- and for all other categories candidates application fee is Rs.250/-. Pay the application fee @ SBM or SBH through system generated chalan while submission of online application forms. Written test will be conducted on same day at all centers for the candidates who clear the physical tests. Apply online @ KSP Online official website @ http://517srpc18.ksp-online.in. Fill all the necessary information and upload the images of photo and signature. Generate the chalan form and pay the fee on or before 27-08-2018 and update the same in online application. Hall ticket for physical tests will be updated in the same website.